Racecar driver Kate Reilly is suited up and ready for the start of the legendary 24 Hours of Daytona. But what's ahead will test her will and nerve more than any other endurance race. Even before the green flag waves over Daytona International Speedway, Kate receives word her boyfriend Stuart is fighting for his life after a hit-and-run earlier in the day. Still reeling from that news, Kate must absorb other shocks in the race's opening hours, including an on-track accident with tragic consequences and an eyewitness who claims Stuart was run down deliberately by someone from the race paddock. 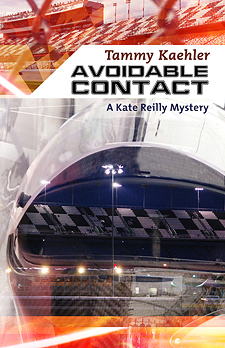 Alternating stints behind the wheel of her Corvette racecar with stretches of quizzing colleagues and searching for clues, Kate taps every possible source—friend, foe, and family—to find out who's after Stuart and why. As the race clock counts down to zero hour, Kate must come to terms with her own fears about the past and decide who she's willing to trust. Only then can she identify who's willing to kill to keep a secret buried—and stop them before they lash out again. "This book revs the suspense past 10,000 RPM on the first page and keeps it there until the last. Tammy Kaehler sure-handedly steers readers deep into the world of endurance racing with an entertaining cast of characters. I'd ride shotgun with Kate Reilly any day." "Snappy dialogue, a smart and affable heroine (who calls to mind auto racer Danica Patrick), and pacing reminiscent of 24 combine to make this entry as exciting as a spin around the speedway." "I have absolutely loved watching how Kate has developed through the first few books, and thoroughly enjoyed how close to reality Tammy has made so many of the racing-related storylines that Kate finds herself in. This series always leaves me wanting more, so I cannot wait to keep reading and see what's next on the horizon for my fellow female racing driver!"